Remember that peanut butter that I made, that was really more like a thick peanut paste? It didn’t go to waste! It works brilliantly well in scotcharoos! 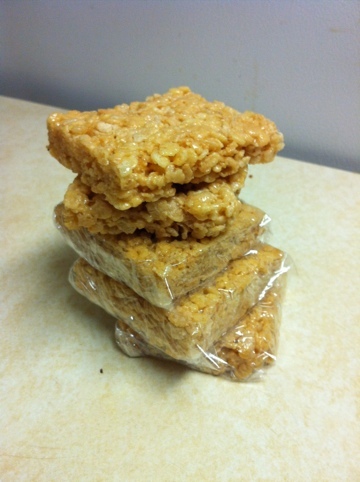 (I’m not into chocolate, so these are really just peanut butter Rice Krispie treats.) Just melt it a bit and toss it in. Yum! MMmmmm... cider vinegar. Thanks to AlyssssyIA for the photo. Vinegar, in general, tends to get a bad rap, at least as far as sayings go. Take “full of piss and vinegar,” to describe someone who’s crabby. Or “You’ll catch more flies with honey than vinegar” for when you want to help a friend with a fly problem (or perhaps comment on their mood). Vinegar is the symbol for sour personalities and bitter emotions. And cider vinegar, in particular, has some great health benefits. Now, according to ye ol’ WebMD, cider vinegar can help control blood sugar levels (especially important if you have diabetes), and it can help you feel fuller if you take a tablespoon or two with a meal (important if, like me, you’re hungry A LOT). And it may also help control blood pressure and improve heart health. I see nothing bad about that.